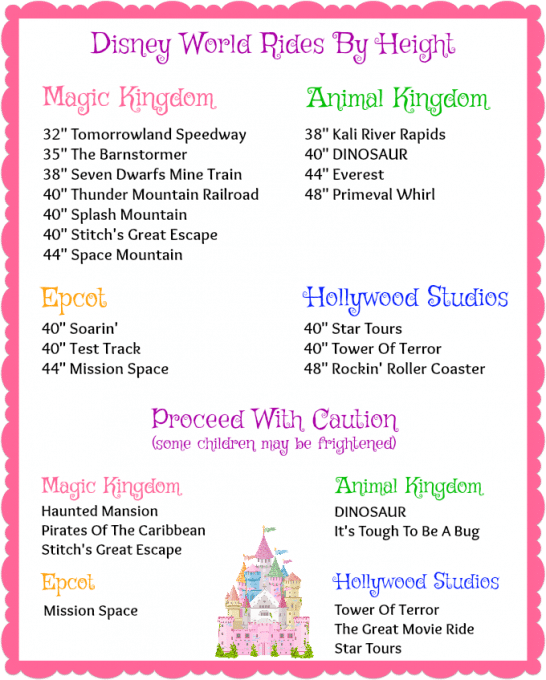 Is your child big enough and brave enough to ride all the Disney World attractions in the parks? Find out which rides have height requirements and which ones might just be a little too scary. Take the free printable with you so that you’ll have a cheat sheet while you’re there. We moved to Florida a couple years ago and were super excited to be living so close to Disney! One of the first things we did was to buy annual passes. At the time, Keira was just 2 1/2 and there were a lot of Disney World attractions that she couldn’t ride. As she’s grown, she’s been able to ride more and more and it’s fun to see her excitement when she realizes that she can ride the same things as her big”sissy”. Every time we go, we have to figure out what new rides she has grown into. Once she hit 40″, it opened a lot of doors and I was constantly checking the Disney guide for the the height requirements. I decided to make my life a little easier by making a fun printable to keep on hand. I think Keira just may be at 44″ next time we visit and now I’ll have this handy sheet to refer to. There’s also a section at the bottom listing rides that may be frightening for young children. These things really depends on the child and you know your child best. At 4 1/2, my Keira loves Tower of Terror and Pirates Of The Caribbean. However, she hated Mission Space and It’s Tough To Be A Bug. If your child scares easily, it’s probably best avoid these. There are so many other attractions to enjoy that you probably won’t miss them anyway. If you’re heading to Disney anytime soon, feel free to print this out and keep it in your bag. You’ll get a feel for what rides to avoid and it’ll be easier than trying to look it all up as you go. Most important of all, have a wonderful, magical time (though it’s nearly impossible not to)! What are your kids favorite Disney rides? Do they shy away from the scary ones or are they all in?